I can get used to this short work week thing! Woo! I hope you all had a great week! I'm sitting here typing this up with a homemade pumpkin coffee sitting next to me, and it smells heavenly. Am I the last one to figure out that sprinkling some pumpkin pie spice in your coffee makes it instantly amazing?! Today I'm linking up again with Christina, Darci and some other fabulous ladies to share my five favorites from the week! ONE: Our Wedding was Featured in Every Last Detail! As we approach our 6 month anniversary (and 6 years together!) 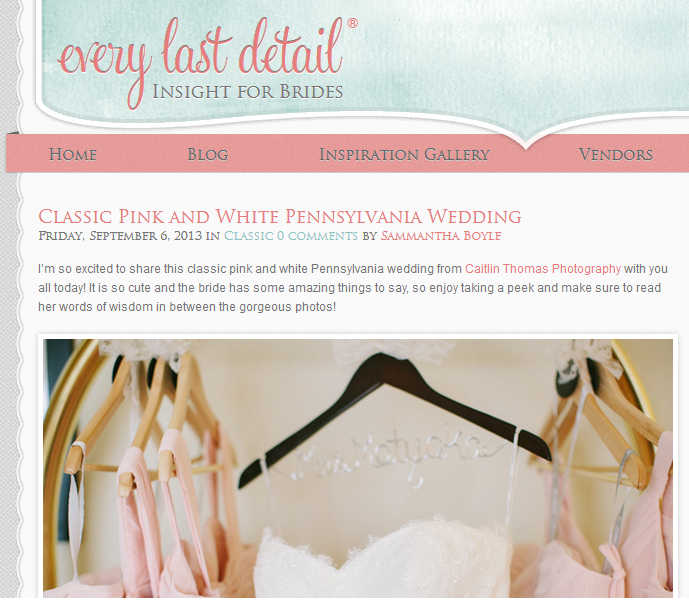 I am excited to share that are wedding is being featured today on the lovely Every Last Detail blog! Yay! Looking through pictures of our big day will never get old! I'm hoping that our feature will be inspiring for other brides or maybe some of my advice will be helpful. I'm also so glad our photographer's hard work gets to be featured because she was amazing and totally deserves the credit! So I've been on the lookout for a tray to help style our dresser in the master bedroom, and I'm not sure if I'm totally sold on this one yet, but its perfect for now. It was so easy to make a personalized tray... I'm already planning it out for Christmas presents so if you get one from me, try to act surprised. On another note, is it odd that I only have 2 perfumes and my husband has 4?? I think I need to go shopping this weekend! ha! Ok I know she looks less than thrilled to be wearing this, but its so stinkin' cute I couldn't not put it on her when I was unpacking our Fall decor this week! I got it for like 75 cents after Halloween last year and its actually a cat costume... ha! 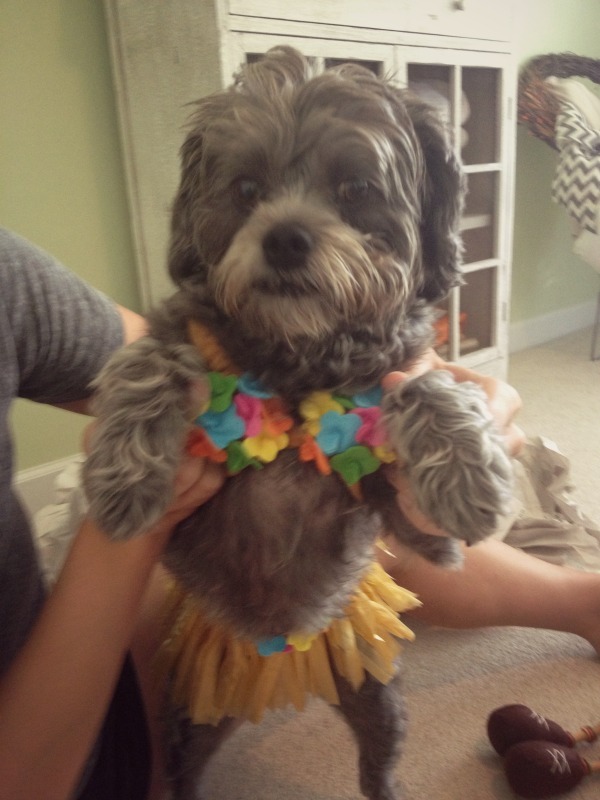 She does this dancing on her hind legs thing, so I need to find some sort of pet costume competition and show off her hula dancing skills this year! So I did a little planning and my September blogging calendar is packed full of fun Fall posts, DIY projects, recipes, and some other random tidbits so I'm really excited to share them with you! I've also been working on some updates to the pages and hopefully (if all goes well and I don't accidentally delete the blog entirely... knock on wood) those will be ready after this weekend! On another blogging note, I have to thank those of you who have shared my blog with your readers as you nominated me for the Liebster Award! If you've never heard of it, its basically a way to share your favorite new blogs, get to know each other more, and get discovered by new readers.. which is always a good thing! Since I've got a lot planned this month I don't think I'll be dedicating a full post to it, but I want to give these wonderful bloggers all a major shout out! If you have time, please check out Kayleigh from Life of Ry's, Morgan from Makeshift Margaritas, Lindsay from Life with the Rashids, Charlotte from My Crazy New York Post-Grad Life, and Elena from The Road to the Baby Riley Bump because these ladies are super creative and so sweet for thinking of me! In the meantime I'll try to work on a post answering some of the questions these ladies have asked, so if you're interested in the slightest bit, you can get to know me a little better! Thank you!! 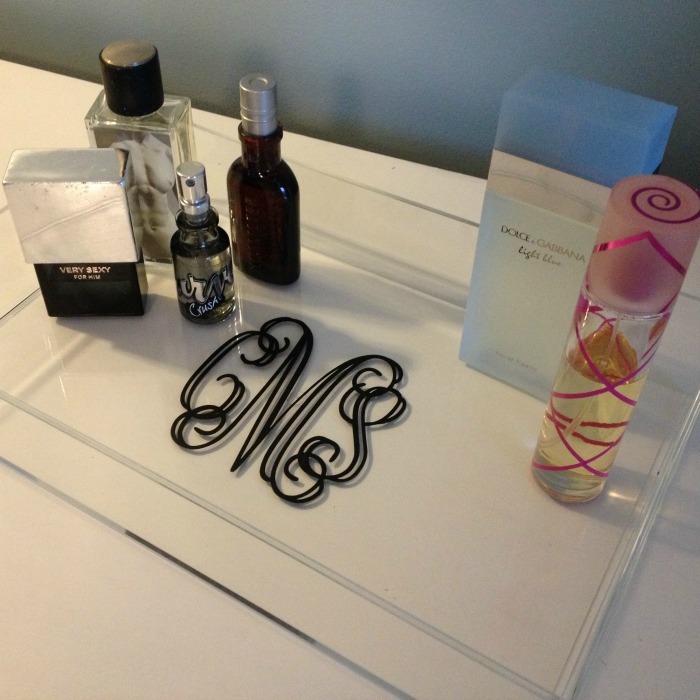 It was so easy to dress up that clear tray with a monogram! Happy Friday! Congratulations on the award - that's awesome! Love that tray! Congrats on your wedding being featured! The monogrammed vanity tray is super cute! D&G Light Blue is my fave! I agree with megan! Love light blue!! And congrats on your wedding being featured! Exciting!!! Congratulations! That is such great news! And Ruby's costume is "da bomb" so sweet. oh my goodness, that is SO cool about your wedding! And I love how you did your bridesmaids hangers, I've been looking for a way to put their name on it, that isn't going to break the bank with the wire hanger for each! Do you have more pics of those? Happy Friday! Thank you! I actually made those hangers for really cheap! The wooden hangers were from Ikea, I think there were like 8 in a pack for less than five bucks! The name tags are just cheap wood cutouts from Michael's sprayed with chalkboard paint and attached with hot glue. Then I added a bow. So easy! Unfortunately that is the only picture I have, but you can totally do it! My mom helped and it was a fun little project to do together. Ahhh, little Ruby looks adorable! She's so cute. Halloween is right around the corner. Awesome about your wedding!! Being published makes the hard work all worth it!! That vanity tray is beautiful. I love you dog! Girl yes, aren't these short weeks the absolute best! I LOVE that vanity tray. I have to have one. That's awesome about your wedding! It all looked so beautiful!!! Love the costume on Roby as well. HA! What a gorgeous wedding post!! Also, I love your monogram tray -- great idea!